Take Advantage of Posted Pricing at Our San Antonio, TX, Dealerships! At the Kahlig Auto Group, our goal is to provide our clients with a top-notch customer service experience at every turn. Whether you're shopping for a new or used car, we want to help pair you with the perfect vehicle to suit your unique lifestyle. Our sales specialists will work with you to find your ideal car, truck, SUV or van, one that not only meets your needs, but fits seamlessly into your budget. That's where our Posted Prices come in. Whenever you shop for a pre-owned vehicle at any of the Kahlig Auto Group dealerships, you can take advantage of our Posted Pricing policy to find the right vehicle for the right price. So what is our Posted Pricing policy? It's our competitive, no-hassle approach to pricing our pre-owned inventory. This means that when you're looking at a used car, you'll only see the price you'll pay, with no negotiation necessary! This price is determined using a market-based pricing strategy. We take factors like model, options, mileage, trim level and levels of certification into consideration before creating a market valuation and settling on the most competitive price we can offer. Thanks to our Posted Pricing policy, we can provide our customers with a completely transparent experience from start to finish. After all, with no need for traditional negotiation, there's no hassle left to worry about. The only trouble you'll ever have at our dealership is deciding which of our amazing used cars to drive home! 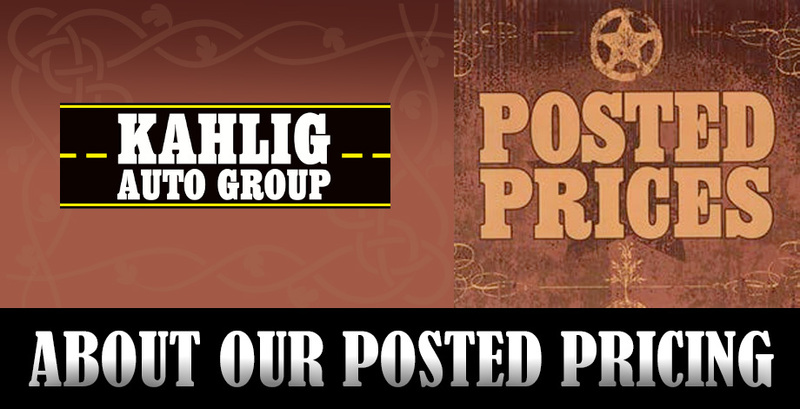 To find out more about our Posted Pricing, visit any of the Kahlig Auto Group car dealerships in San Antonio, TX. Explore used cars from brands including Lincoln, Subaru, Mazda, Lexus, Toyota, Volkswagen, Ford, Jeep, Chrysler, Dodge and more!